What are the benefits for our company? How will we get what we want? Did we all agree to go for it? This should be done before you start a company and should continue to be done as a regular part of planning new projects and initiatives in a corporation of any size. A successful business case will either convince you, the approvers, and key stakeholders to invest in the case, or it will convince the people involved that it is NOT worth pursuing. Yes, you heard me right, deciding not to pursue a business opportunity is a sign that your business case development was a success. Imagine if you hadn’t done a business case and had wasted time and money on an opportunity which wouldn’t have been worth pursuing. 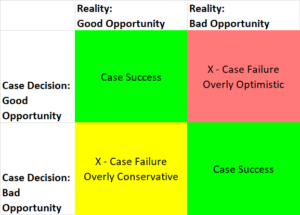 A business case failure is when information in the case doesn’t align with reality or when the wrong priority is put on trivial setbacks which never should have stopped us from pursuing the opportunity. 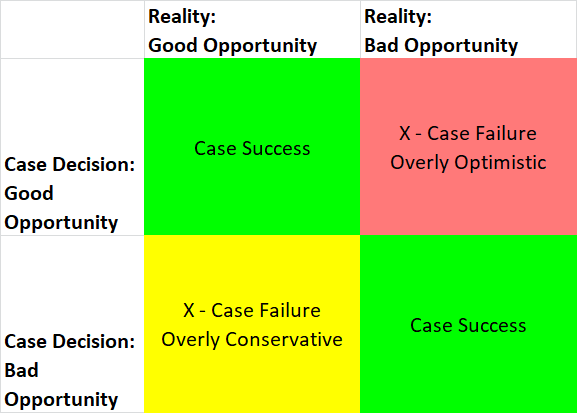 This 4-box shows at a high level what success or failure of business case development looks like. Most business cases are in perpetual draft state. Don’t feel like it needs to be perfect, keep it iterative and keep revising. An imperfect plan in front of the decision makers now is better than a perfect plan too late. I have set entire multi million dollar programs in motion by writing a two page plan which basically had six quotes from customers stating their pain, asking for just enough money to go figure out what our options were and getting approval from my GM. You’ll notice I covered the three critical bases. That program ended up being a multi-million dollar product development exercise which grew into a more mature and developed business case when it became appropriate. It is critical to use some form of version tracking to ensure that you always know what the latest and greatest version is. You could include a revisions section or you can use something as simple as a version number in the file name. Developing a business case is a process. The product of that process is not just a document. The product of good business case development will be insights, plans, market knowledge, product knowledge, financial models or risk mitigation plans and so on. You will create a document which is called the business case, but you will have so much more. So keep that in mind as you’re filling in the business case document, this document isn’t the only product, you can hand over additional learnings and so forth outside of the business case document. I have had one version for the program manager which include just about everything, one version which was a presentation for management, a complicated spreadsheet model for the finance guy and the product manager, and a presentation full of pictures and mock ups for the engineers. At the kickoff meeting for the program, there were only a few people who hadn’t already seen or contributed content to the official “business case” which we used to document our keys: Why, How, and Approval. In several cases we only had customer voices a lead engineer and a GM’s approval for a small investigative budget. Another case included gaining alignment between 3 GMs for what product to focus on so we didn’t all go spend money developing three different products for the same market. That was an exercise in managing up! Such a fun challenge! Start the case when you don’t know the answer yet. The most successful cases are iterative collaborations. All of the successful business cases that I have written were more like a collaborative project team that I led, where we developed the case together. I used my ownership of the document to ensure that the appropriate information and focus areas made it into the case. Version 1 should be a few thoughts on a page for each of the categories below which you think are relevant. Shop this v0.01 draft around with all of the functional experts, people or areas which you think will have a say or have something to contribute. Then iterate and keep adding. Get the financial expert involved as soon as possible, get the quality control team and the customer care team involved. Make sure you include interviews with all of the approvers early on so you have their key pass/fail requirements and their thoughts so you don’t waste months only to have the engineering leaders say “no” at the approval meeting. When developing a case you need to understand your own bias. I am a very optimistic person. I learned the hard way that the business opportunity which I thought would be worth Hundreds of Millions of Dollars was off by an order of magnitude… or two. Make sure you understand yourself and your personal tendencies when you are writing your case. And don’t just compare yourself to the other optimistic person you know and say “I’m a pessimist compared to them, so I’m OK”. I am providing three version of a business case template. The first is a skeleton case which you should use for items which are just starting out and only have the beginings of an idea about. The second is a standard business case, which is probably fairly focused on a product development standpoint. The third is an exhaustive business case, which includes just about every category that I have seen in a business case. I personally prefer to start with the exhaustive list and cut stuff out, but that’s because I am very comfortable using the proverbial axe. If you are just getting started then you probably want to use the skeleton or standard templates.